Who can enter? Only Australian residents aged 18 or over can enter. Where will the competition run? This competition will run in all Australian liquor licensed outlets (e.g. bottle shops), including online retailers (Outlets) and Australian liquor licensed venues (e.g. bars) which are stocking Qualifying Purchase products (Venues). Do I need to buy anything to enter? Yes. 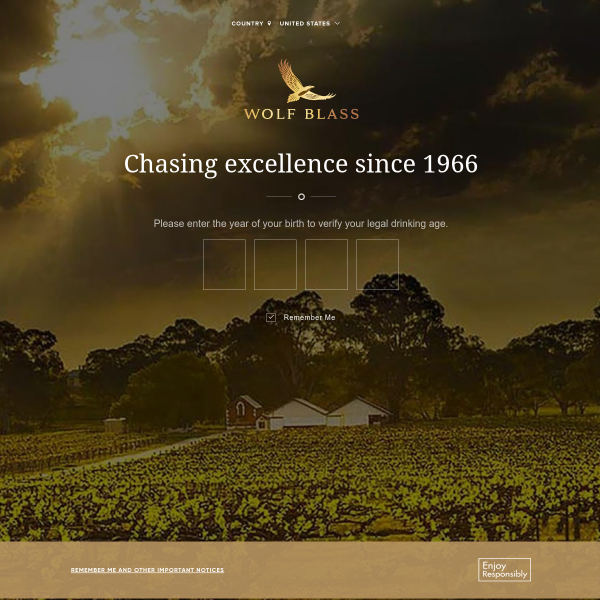 (b) buy any 2 glasses of Wolf Blass wine (excluding Eaglehawk) – one for you and one for a friend – in one transaction (also, a Qualifying Purchase) for on premise consumption from a Venue, and retain your itemised purchase receipt. For the avoidance of doubt, Qualifying Purchase products do not need to be specially marked. Purchase receipts must clearly identify the Outlet/Venue of purchase (which must be a participating Outlet/Venue), the product/s purchased (which must be/comprise a Qualifying Purchase) and the date of purchase (which must be during the Competition Period before you submitted your entry). Entry instructions	After you have made a Qualifying Purchase, you must during the Competition Period, visit www.wolfblass.com (Website) follow the links to the entry page and fill out and submit the online entry form, including by uploading an image of the Qualifying Purchase receipt and all other requested information. You will be entered into the major draw, and, if you entered between 01/04/2019 (AEDT) and 30/05/19 (AEST) (inclusive), you will also get a return online message informing you if you have provisionally won an instant win prize and if so, details on how to verify your entry. If you entered between 01/04/19 (AEDT) and 30/05/19 (AEST) (inclusive) and you haven't won an instant win prize you will be entered automatically into the second chance draw. How are instant win prizes awarded? There are 201 instant win prizes to be awarded based on pre-determined times during the Competition Period selected by a computerised random system at Prime Focus, Lvl 1, 500 Chapel St, South Yarra VIC 3141 (Prime Focus). How many winners will there be and how will they be chosen? There will be up to 202 winners determined in respect of this competition – 201 instant winners and 1 major winner. The major draw will be held at 1pm (AEST) on 08/08/19 at Prime Focus. The first valid entry drawn randomly from the entries received during the Competition Period (including instant winning entries) will win the major prize. The Promoter may draw additional reserve entries and record them in order, in case the winning entry/entrant is deemed invalid, or any prize is unclaimed (Reserve Entrants). What can I win? There are in total 202 prizes available – 201 instant win prizes and 1 major prize. Each instant win prize is a $100 EFTPOS gift card. EFTPOS cards can be used anywhere in Australia where EFTPOS is accepted. EFTPOS cards are subject to the prize supplier's conditions, including validity periods. There is a limit of 1 instant win prize per person (excluding SA residents). • 2 x diamond tickets (i.e. 1 for the winner and 1 for an adult companion) to each of the 2019-2028 (inclusive) NRL Men's Grand Final matches valued in total at up to $8,000. The major prize is a total of 10 double passes; 1 per year for 10 years. Tickets to any replay matches are not included. The winner must select either AFL or NRL when specified by the Promoter. Once this decision is communicated to the Promoter, the winner cannot change their decision. The winner will be required to liaise with the AFL or NRL (as relevant) each year in order to receive their tickets. This may include making contact via a specific method and by a specific date. The Promoter will provide further details regarding this in due course. See paragraphs 5 and 6 for further major prize details. Total prize pool	The total instant prize pool is up to $20,100. The total major prize pool is up to either $9,102.32 or $8,000 depending on whether AFL or NRL is selected. The overall total prize pool is up to $29,202.32. How many times can I enter? Outlet entrants can enter up to 6 times per person per day, provided you only enter once per Qualifying Purchase. Venue entrants can enter up to once per person per day. Each entry must be submitted separately in accordance with these Terms and Conditions.